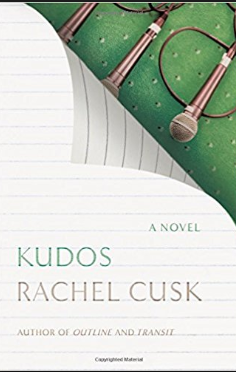 The novel opens with a woman on a plane, heading to an annual writer’s conference held somewhere in Europe. She begins a conversation with the man sitting next to her. He proceeds to tell her a long story about his family dog. It’s a very good story, one that held my interest for many pages longer than it should have. I enjoyed it, though I wondered what it would have to do with the rest of the novel. Why was the author taking so long to get the story moving? What was she up to? I was interested. What was going to happen in this slim book? Big print and excessive white space makes it just over 200 pages but it could easily be novella length. Then the woman met another person who told her a long story. And another. And another. And another. Some of the stories were interesting, some less so, but it wasn’t long before I began to dread that that was all there was going to be. I did finish the book, but it never came together into anything more than a series of random encounters as far as I could tell. I’m interested in seeing what the judges at that Summer Reading Challenge hosted by The Rooster will have to say. Maybe I missed something in my reading, but I don’t think so. This is the first time I have done the Summer Reading Challenge. I’ve read five of the six books–I’m still on the waiting list at my local library for Circe by Madeline Miller. It’s been a very mixed bag. All of the books I have read for it contain very good writing, but not all of them have been good reads. I have found some very good books, and I have enjoyed reading the judges comments, but I have not found any gems like I have with the Tournament of Books. No “New Favorite Books” in The Summer Reading Challenge. In fact, I almost gave up on Kudos. But because I didn’t I did have a fun moment towards the end of the book. After 150 pages, there were finally enough clues for me to determine that the literary conference was taking place in Lisbon, one of my favorite cities in the world. One of the last people the author meets is a local who takes her to a strange church, one was burned out in a great fire. The walls are black, the ornamentation looks melted, the inside is completely dark. But worshippers continue to come. They have placed lights where there used to be statues, but they only server to accentuate how dark the building’s interior is. I thought, I know this place. I’ve been to this church. It’s an amazing place, though not quite as the author describes it. I also found it by accident. I’m on of those tourists who will basically wander into any open door I encounter whether I should be there or not, so when I passed by the church on a walk around Lisbon, I entered though it was clearly a place of active worship. It was packed, mostly with local women engaged in prayer gathered in groups around various niches where candles provided the only light in the room. There were so many niches, so many candles that it was really easy to see the room, but just the lower part of it–candle light, even a lot of candle light, only lights up the bottom portion of a big room. The room was nearly silent, though it was full of people and devoid of ornamentation as Ms. Cusk describes. Burned out, but beautiful. I never learned the name of the church but I never forgot the experience. 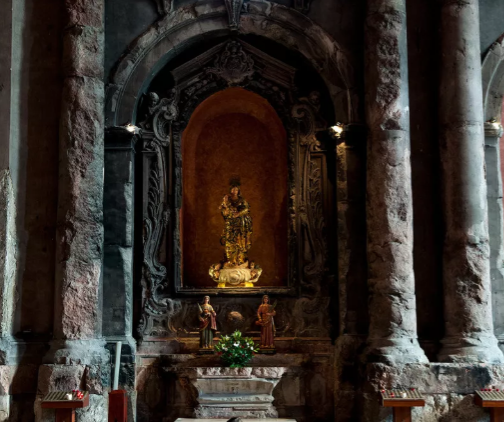 Google searches suggest that I was probably in the Igreja de São Domingos which suffered from a fire in the 1950’s, but the images I have found are not what I experienced. Maybe I wondered into a special room, maybe the windows had been covered with curtains, maybe I was there on a very special day for the congregation, but this image is not what I saw that day. I was there years ago, back when we still used cameras with film inside, and while I am the kind of tourist who will wonder into places he does not really belong, I’m not the kind of tourist who takes pictures of religious events meant to inspire quiet contemplation. Certainly not flash pictures. So I do not have any pictures to prove it. And a passage in Rachel Cusk’s book. This is the third part of a trilogy. I liked the first part very much, but thought the second fell flat. I just picked this up from the library, as I might as well finish it out. We shall see.